I am going to follow the “official” colourscheme (nature colours greens and browns) since I feel it is the right colours and I love the green/brass armour bits. However, I will allow myself some artistic freedom to bring forht the history of the miniatures, for example Baldur has red coat to symbolise his Khadorian origin. While I appriciate that the real Baldur would hardly wear anything connecting him to Khador, I think it is a good way of showing his history. Bases are made of a mixture of “Realistic Water” from Woodland Scenics and model foliage to give the minis a foundation in the wild. It doesn’t come through all that well on the photo but the water is blank. All in all this is a really fast base to do: Paint water, let it dry, fill Realistic Water on top let it rest for at least 24 hours, fill another layer if needed, glue some dirt on, paint dirt brown glue foliage on. 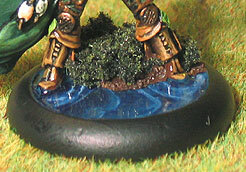 Remember to varnish mini before applying the base since Realistic Water goes wrong if varnished.